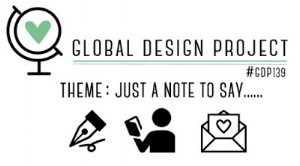 This week the Global Design Project has a Theme Challenge for us to play with! My card has lots of sneak peak items that will be available soon in the new annual catalogue, and here is it. I started with two new colours; Petal Pink and Grapefruit Grove. On top of that I have layered a piece of the fabulous Share What You Love Specialty Designer Series Paper, (available now in the Share What You Love, Gotta Have It All bundle) and I used two new stamp sets. The image is from Enjoy Life, and the sentiment is from the Itty Bitty Greetings. These are both must have stamp sets in my opinion! I finished off my card with some of the new Nature's Twine in Grapefruit Grove. This is a new twine pack with four great colours of twine to coordinate with all your projects. If you haven't started your wish list yet, now is the time. Add these exciting new products to your list and get ready for June 1! !